1.4x teleconverter for autofocus lenses that includes PZ contacts, however reports indicate it does not work with SDM AF lenses, just standard screw-drive AF lenses. I bought this TC here on the Marketplace and have little to add to Baro-Nite's review. My main objective was to get a wee but more reach out of my Tamron 70-200/2.8 for soccer. So, I needed the AF to not be any slower due to the addition of the TC. My Kenko Pz-AF 2x TC caused the 70-200 to refuse to achieve focus lock even in the brightest sunlight The Tamron TCs are outrageously expensive, although not as dear as the Pentax TC. This model appears to be identical to the Vivitar 1.4x TC that others had said worked well with their 70-200 lenses. After a game and several practice sessions the TC has worked like a charm with the 70-200 AF speed does not appear to be observably slower at all Sharpness may be impacted slightly but only when I pixel peak, but contrast does take a slight hit (although nowhere near what the Pz-AF 2x causes). Contrast is easily dealt with in LR and not a real issue for me. At the end of the day, this TC does what I need it to do with the lens I intended it for and I am happy with it. I've marked this as "recommended", but take note of the limitations described below, which are the reason for the lower rating factored into the rating. Optically it is quite good. Bought this from eBay to see if it would be a cheap way of getting a bit more reach from my DA* 200. Based on other reports and from its appearance I guess this is identical to the Tamron/Kenko MC4 model TCs, except for the lack of working PZ contacts. (It actually has the contacts on the camera side, but they do not connect through to the lens.) I wasn't expecting the SDM to work so was not disappointed, however the TC is not really compatible with the DA* 200. AF doesn't work even with the DA* 200's screw drive, the menu and info buttons become inoperative (on my K10D). The latter issue can be corrected by shorting the data contact, but then the aperture info is off by two stops. I also tried it with an A-series lens. Again, not fully compatible -- the aperture info is off by two stops. Camera functions normally, though. See second addendum, below. This TC does work well with the other DA lenses I've tested it with, namely the 18-55 and 50-200 zooms. Aperture and FL data is correctly transmitted to the camera, and AF works well, even in fairly low light with the 50-200 at 200mm, where it is f/5.6. FL data is passed straight through, so shake reduction will not account for the extra magnification of the TC, but I don't know of any Pentax-compatible TC that does so. Pixel-peeping reveals a slight loss of contrast and sharpness. The TC introduces a slight warm cast, at least compared to the DA 50-200 (which is somewhat cool to begin with). I had read a report that the Kenko/Tamron 1.4 TCs actually only achieve 1.34, but according to my test this one really is 1.4x or just about (1.39x, maybe). Optically, I rate this TC an 8. Build quality seems reasonable. If you want a TC to work with your non-SDM DA lenses to get a little more reach, this isn't a bad choice. Addendum: Also fully-operable with the Sigma EX DG 70mm macro. Based on this I will tentatively conclude that this TC works correctly with any DA or DA-equivalent lens that does not have SDM and does not have an aperture ring. I don't have any FA lenses to test it with, but based on the test with the A-series lens, I have my doubts see below. Second addendum: After further study, I realized that the reason my A 400/5.6 didn't work correctly with this TC is that the TC has bare metal in place of the second A- contact, as you can clearly see in the photo above. The only lenses this should affect are A-series lenses with a minimum aperture of f/45, just a few of the extreme telephotos. (Even with those you could restore full function by putting insulating tape over that bit of bare metal.) My guess is that all other A-series lenses will be fully compatible. Most lenses from the F-series onward also have bare metal in place of this contact, so I expect the TC will be compatible with all but the DA* lenses. I have increased my rating from 6 to 7 because of this. I bought this from Adorama because I needed one 1.4x TC and the others were to expensive and could not find one. It was a great surprise, this TC works, it has decent lenses and does not change the IQ significantley. 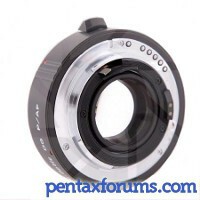 It is a great alternative to the expensive Tamron 1.4x. I recommend it.